The 19 July marked a significant celebration for Our Lady of Lourdes, Wanstead. At a Mass of Thanksgiving held to mark the 90th anniversary of the church, Bishop Alan Williams ordained Gary Dench, who has been in training for the priesthood, to the Diaconate. Then, parishioner Derek Kelly received the Benemerenti medal from Bishop Alan for his work in the parish. The church opened on the 14 October 1928. Later on he began to think about priesthood and after a four year degree in Theology and Church History at Edinburgh, and work for an MP, a law firm and in politics, he decided to pursue his vocation. After a year at Valladolid, he went on to study at the English College in Rome. 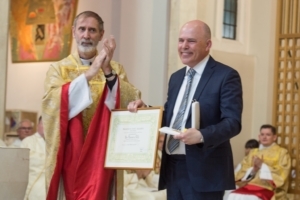 “The inspiration of an Anglican vicar I knew as a child, and the support and kindness of priests over the years in Rome and the diocese have brought me to this point,” he says.